#photographicmemory is a feature in which someone sends in a nostalgic photo of themselves and writes about it. It was created because sometimes you can find out more about a person by asking them to describe a photo than by asking them a ton of questions. It was also created because it’s nice to look at pretty photos. 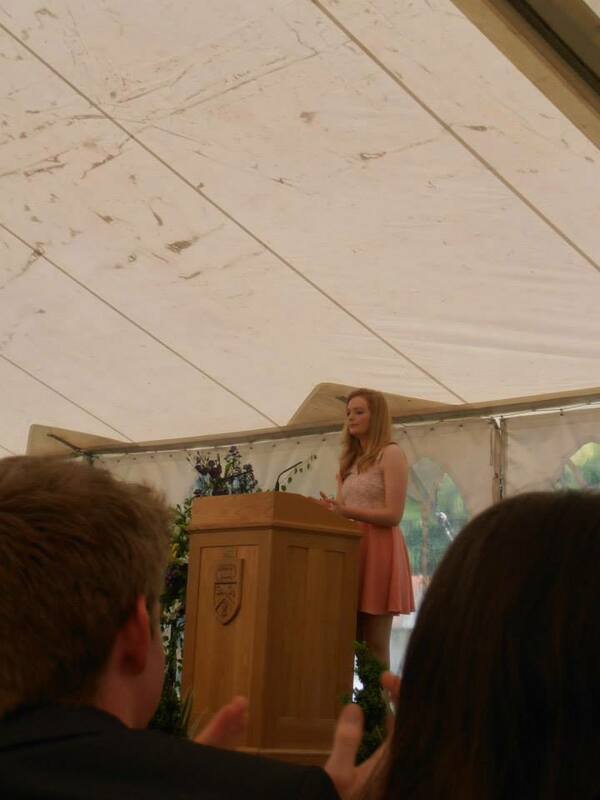 This photograph is of me making the closing speech at my school’s commemoration speeches, on my last official day of school. My friends Harry and Sarah can be seen clapping in the foreground of the photo, which I imagine means that I have just finished speaking. I remember very clearly how I felt at that moment. I had often heard people talk about sadness which was so strong that it could be physically felt, but in that moment I discovered that there can be happiness that has the same effect: happiness so strong that I could actually feel it inside my chest. In some ways, in the intervening months, I have changed to the extent that I barely recognise the person I was on that day. But in others, I still am, and hope always to be, exactly like that person. This day, which I still remember as being the 25th of May (about the only date I have ever succeeded in committing to memory), marked the start of three weeks of A level exams. I am probably one of very few people in the world who considers the time which she spent taking her A levels to have been the best time of her life. At the time, I am sure I had all the usual worries about messing up my exams (although in retrospect these were token gestures, flanked by the awareness that deep down I was in fact probably good enough to succeed in them, not something that I can say that I have felt since coming to Cambridge). But I have no memory of this now. I only remember that the sun was always out, everyone I loved was around me, and I was happier than I ever could have imagined being. These few weeks culminated in a chapel service for all those who were leaving my school. It was about halfway through the service that I started crying. Not because I was sad, but because I was happy: happy because I knew that whatever went on to happen in my life, I could say for certain that my time at school had been extraordinarily, astoundingly perfect. My 70 (ish) year old Greek teacher, a wonderful relic of the old school of teaching, took it upon himself to cheer me up with the help of most of a bottle of champagne that he had appropriated from somewhere, and from that moment I spent the rest of the day in a peaceful, emotional haze. My only concern at the time was that this might somehow be it: that I had hit my peak at the age of eighteen and would never be as happy again. I don’t think I need have worried. Certainly, in the time since, there is naivety and innocence that has been lost, which makes such a pure type of happiness unlikely to repeat itself. Ironically, in part as a result of seeds sown during those three perfect weeks, but also as a necessary by product of becoming an adult. But then I think of a more recent speech I made, just a month ago: in a 13th century wood panelled dining hall, to fifty people who have gathered there to celebrate my nineteenth birthday in a wine induced haze. When the meal finishes, there is banging on the table and singing, demands for a speech. I get clumsily to my feet, attempt to stand on my chair, and then get down again, deciding sagely that I don’t trust myself. I grin delightedly at the faces looking up at me, faces that I didn’t even know existed when this photo was taken, which now belong to some of the people I love most in the world. And in that moment I realise that the photo which you see above, far from being the peak of my life, is just the beginning. Charlotte is a Philosophy student at the University of Cambridge. Her attempts to avoid this fact have led her to become Features Editor of the Cambridge Tab, to produce and write plays, and to take on various sporting responsibilities that she almost certainly isn’t qualified for. Recently, she has taken up rowing. Things are getting desperate. I read this article and found it very interesting, thought it might be something for you. The article is called From One Speech to Another – #photographicmemory and is located at http://prancingthroughlife.com/2014/04/07/photographicmemory/.